I'm a cook. It's what I do, and what I've been doing since I was a picky kid who wanted things to taste a certain way, and the only way to achieve that was to do it myself. That being said, I'm not a great baker. I love cooking ad hoc, finding whatever is convenient in the fridge and pantry and throwing things together. It [almost] always turns out delicious, so this method has been tried and true. But throwing things together in a baked dessert isn't really feasible. There's a science to things, and just eyeballing a recipe isn't going to cut it. So I always take cues from friends who are great bakers and from my favorite food blogs that consistently churn out exceptional recipes. I'd like to become a better baker, but since I don't have much of a sweet tooth, I need to rely on friends and family to inspire me to bake. A good friend's birthday was last week, and at the last minute, I decided, 'why not bake him a cake?' I asked him to challenge me, and tell me if he could have any cake, flavor wise, what would he want? He mentioned loving all things lemon and caramel. CHALLENGE ACCEPTED! Preheat the oven to 325F. Grease and flour two 9 inch cake pans. Combine butter and milk in a saucepan until the butter melts, making sure not to scald the milk. While allowing the mixture to cool, sift together flour, baking powder and salt. Slowly add the flour mixture in batches just until combined [it's okay if it's lumpy at this point]. Add the cooled milk mixture along with the vanilla and lemon extracts and stir well. Pour batter into the prepared pans and bake for 25-30 minutes, until the cakes are pale gold, when a tooth pick inserted comes out clean, and begin to pull away from the side of the pans. While the cakes bake, combine the juice of one lemon with a quarter cup of sugar in a saucepan. 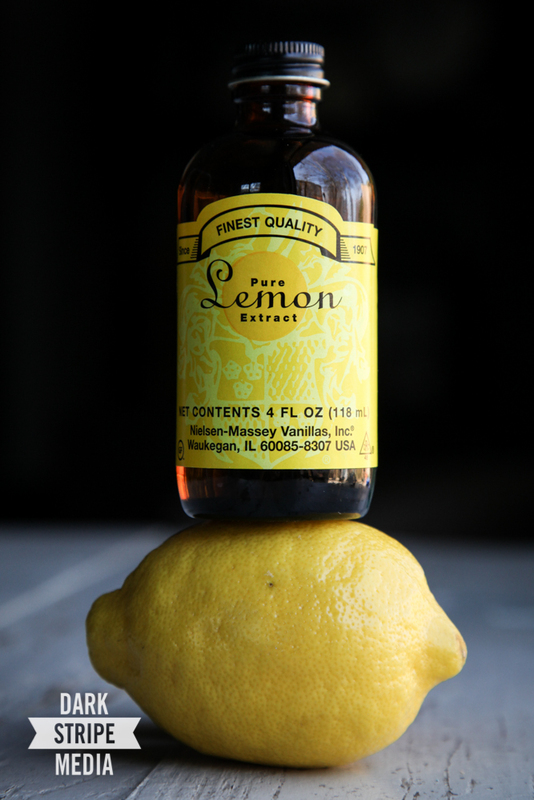 Add a couple tablespoons of water to thin it out [this just depends on how much juice your lemon had!]. Heat and stir until the sugar dissolves, then allow to cool. Once the cakes are done, cool in the pans for 10 minutes on a wire rack. Turn out the cakes and pour the lemon syrup over both cakes evenly. This step is what takes the cake to new heights. The syrup keeps the cake moist, while also adding an extra punch of lemony goodness. While cakes cool, make your icing. In a saucepan, combine the brown sugar, 1 stick butter, evaporated milk, and vanilla. Bring to a boil over medium-high heat. Stir well and then adjust the heat so that the frosting boils and bubble gently. Cook for 7 minutes. [sometimes this takes less time, but just look for that caramel color to form, and you should be good!] Remove from the heat and let cool for 5 minutes. Beat the icing with a spoon until it thickens, 2 to 3 minutes. In a mixing bowl [preferably a stand mixer] beat together the softened stick of butter and powdered sugar until thoroughly combined. Fold in the caramel and add in any extra powdered sugar to achieve the consistency you like. I prefer a thicker icing, so I added extra, but it's just a matter of preference! My icing ended up tasting almost identical to my favorite.cake.ever. from this place. I'm not even a huge caramel fan, yet I order this cake every year for my birthday [now I may not have to since I can create it myself!]. Place one cake layer on a cake stand or large plate. Quickly spread some icing over the top and cover it with the second cake layer. Ice the top quickly and then spread the remaining icing over the sides. I forgot to take a photo of a slice of the cake, but it actually turned out lovely. I kept things simple; no fancy decorations [this was a guy's cake after all]. I didn't know what to expect when combining the lemon and caramel, but this one is definitely a keeper. It's the perfect pairing of tart and sweet. Yum!